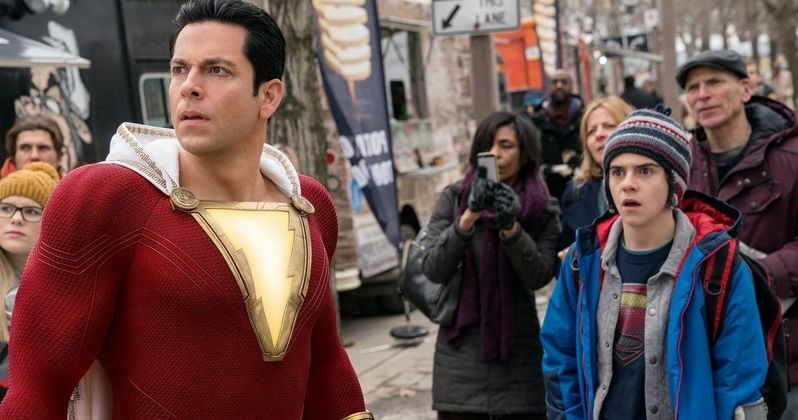 Shazam First Reactions Fly In: Did DC Hit Another Home Run? The first reactions to Shazam! are in. This movie is following in the wake of Aquaman, which went on to become the highest-grossing DC movie ever at the box office and won over moviegoers worldwide, even if it still didn't totally crack the code totally with critics. That has put perhaps some undue pressure on this latest DC adaptation. But it doesn't seem to matter as there is nothing but praise for director David F. Sandberg's movie thus far. Ash Crossan of Entertainment Tonight goes so far as to call it near perfect. "#Shazam was damn near perfect in my book. My favorite DC movie (DCEU? What are we saying now?) by far. Pure of heart, incredibly funny, full of in-jokes and references. Brought me a childlike joy to watch. This role was made for Zachary Levi... & Jack & Asher & the entire cast." After Justice League was released in 2017 and served as yet another disappointment, which was only amplified given how good Wonder Woman turned out, Warner Bros. did some shuffling around with DC Films and whatever they're doing seems to be working. In this case, they're drawing lots of comparisons to Tom Hanks' Big and the key seems to be balancing the humor, heart and action without going too heavy on any of it. Perri Nemiroff of Collider had this to say. "#Shazam is an absolute delight! Super vibrant, tons of heart & a great fun-loving vibe. The family element is a big charmer & so is the humor that comes with watching Zachary Levi explore his new powers. Said this after IT but it's worth repeating, Jack Dylan-Grazer is a star." Shazam sees a young boy by the name of Billy Batson imbued with powers by a mysterious wizard that allows him to transform into a superhero on par, power wise, with Superman. On paper, that doesn't seem like the kind of thing that a guy known for movies like Lights Out and Annabelle: Creation as David F. Sandberg is would crush, but he did indeed crush it by all accounts. And, surprisingly, his horror skillset came in handy. Here's what Nerdist's Dan Casey had to say. "#Shazam was shockingly good! Reminds of me of when kids' movies were legitimately scary (in a good way). An absolute blast from start to finish, full of heart and hilarity. My face hurt from smiling so much. Amazing deep cut DC references in there too." It certainly bodes well that the studio felt comfortable lifting the social media embargo this early. Indeed, it seems like DC has turned a corner and it's time for the world at large to start getting excited about these movies in a big way. Warner Bros. unleashes Shazam in theaters on April 5. We've included a collection of initial reactions to the movie below.